Thanks for your payment. We appreciate your business. 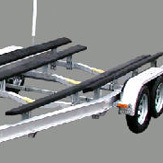 We sell Sea Lion trailers and pre owned trailers of all kinds. We can check and repair if neccesary your Bunks, rollers, axles, brakes, lights, electric, bearings, races, tires, grease fittings, and anything else to make sure your trailer is safe and road worthy. We are equipped with a trailer rack storage system so you don’t have to store your trailer in your yard.